The new generation of energy saving light bulbs is taking the world by storm. But, while on one hand these light bulbs are cost-efficient and longer lasting, on the other hand, they are extremely unsafe to use in the house. In fact, there’s mounting evidence suggesting that these sources of energy are really toxic and pose a serious health threat, especially if broken indoors. The latest research conducted by the Fraunhofer Wilhelm Klauditz Institute for the German Federal Environment Agency confirms that once broken, these light bulbs release 20 times the maximum allowed concentration of mercury in the air. To understand the gravity of the situation, even the U.S. Environmental Protection Agency put forward an emergency protocol to be followed in case of a bulb breakage because of the poisonous gases it releases. The n.1 poison these light bulbs contain is mercury. This powerful neurotoxin is particularly harmful for children and pregnant women. Once ingested, it does most damage to the brain and the nervous system, as well as the kidneys and liver. It can also compromise the function of the reproductive, cardiovascular and immune system. Last, but not least, mercury can incur a number of conditions such as anxiety, insomnia, memory loss, headaches, tremors, even cancer and Alzheimer’s. It’s scientifically proven that UV radiation damages the eyes and the skin. In some cases it can even cause skin cancer. These light bulbs are known to emit UV-B and traces of UV-C radiation, both of which have negative impact on the immune system. Plus, this radiation damages the skin tissues and prevents proper formation of vitamin D-3. Naphthalene, a volatile white crystalline compound, produced by the distillation of coal tar and used in mothballs or as a raw material for chemical production. Styrene, a petroleum byproduct, is an unsaturated liquid hydrocarbon. Both people and pets should evacuate the room. Airate the room for 5-10 minutes. Turn off central heating or air conditioning system. Do not vacuum as this could disperse mercury-containing powder or mercury vapor. Collect the broken glass thoroughly using stiff paper or cardboard. Collect any remaining small glass pieces and powder with a sticky tape, such as duct tape. Put the used tape in the glass jar or plastic bag. Put the cleanup materials in a sealable container. After you have cleaned the room thoroughly, don’t leave any bulb pieces or cleanup materials, including vacuum cleaner bags indoors. Instead, throw these away in a trash container outdoors. Also, it’s advisable to find out about your local government disposal requirements for the area where you live. If there aren’t any, dispose of the materials in your household trash. 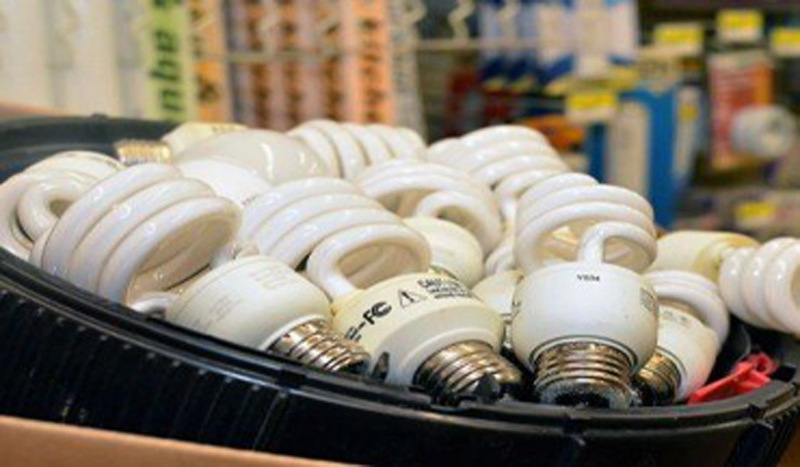 In some areas, there are local recycling centers, where fluorescent bulbs, both broken and unbroken, should be properly disposed of. Last, the room where the light bulb was broken should be aerated thoroughly, with the heating/air conditioning turned off for several hours after the breakage.